I believe it would be helpful in this post if I provided some background as to why I was hesitant to switch from the iPhone to an Android-based phone. My phones prior to the iPhone were: Nokia 3310, Nokia 8310, Nokia 6230i, 3 Phone (with a rotating camera – not sure what model it was) Nokia E71 and the Blackberry Curve 8520. It was around 2010 when I switched to the iPhone 3GS. I have fond memories of texting away on this phone, it was the perfect size and I loved the idea of the app store! Sure this existed on the Nokia Symbian line but for some reason, it never took off – It was probably related to the way Nokia marketed the idea. Through the years of 2010 to 2016 I progressed through the yearly iterations of the iPhone up until the iPhone 6S+. The camera quality within other applications was shocking! I believe this was due to third-party applications accessing the camera directly rather than delegating the task of taking a picture to the Camera app. This resulted in grainy and poor quality images in third-party applications. There was not as much support for applications which were also available on the iPhone. Signal quality was poor! This could, however, be related to me rooting the phone and installing new carrier updates haha! The interface would freeze and lag often and the Android operating system was just slow in general. It was not a great user experience. These issues put me off Android in general for a while. I believe it may have been a year or two later, I decided to give Android another try so I bought a Sony Experia Z3. Unfortunately, I faced very similar issues from the Samsung Galaxy S2 so I sold this phone and continued with the iPhone. I felt like the decision was iOS or Android and this is what it came down to essentially. Sure there are different variants, for example, Samsung provides their own take on Android with TouchWiz but essentially it is the same thing as any other Android based phone. Android is open! This means I can develop applications and upload them on my phone – as a technology enthusiast and programmer this was amazing. I wanted a big change. I had been on the iPhone bandwagon for many years up until this point and if I continued I am sure all my accessories and applications would be locked into the Apple ecosystem – this was not something I was happy about! I was willing to give Android another chance – I heard that Google made huge developments with their Android operating system and that applications no longer randomly crash. Google now! The Pixel was offering Google Now built directly into the phone (not as an app). If you do not already know, Google pretty much specialises in Artificial Intelligence – they are all about analysing data. This (in my opinion) gives Google a one up on personal assistant related tasks when compared to Siri. The key differences I was focusing on when making my decision between the Google Pixel XL, Samsung Galaxy S7 and the Apple iPhone 7 Plus. I also had in mind the number of people who would have a Samsung Galaxy S7. I wanted something different and wanted to try something new – I was already switching to Android so why not try a new phone altogether?! I ended up switching to the Google Pixel XL due to the display, operating system and battery life. The iPhone was out of the question since I wanted to try something new and since Apple decided to remove the 3.5mm headphone jack. The Google Pixel XL was developed by Google which means (hopefully) it will be the first Android phone to receive updates to the Android operating system! The marketing hype also helped to steer my decision towards the Pixel – they decided to take the route Apple generally take. The actual switch between the iPhone and the Pixel was somewhat painless. I am what we call in the industry a “data hoarder” haha! This means I like to collect as much data as possible and I do not like deleting stuff. I still have my pictures, ringtones and text messages from my Nokia E71 and Blackberry! Generally speaking, transferring photos is not a difficult task since you can easily export images and videos to a common format such as JPG and MP4. Transferring SMS messages, however, is no easy feat! I usually transfer my SMS messages between iPhones and Androids by using third-party tools which involve complex migrating techniques such as accessing the iPhone file structure and exporting the sms.db file. However, I decided it was not worth the effort this time around. I, therefore, took a backup of all my iMessage and SMS messages from my iPhone 6s+ and started fresh! Since transferring SMS messages is no easy feat, I decided that this time around I would stick to WhatsApp for my messaging needs since all messages and media can be transferred between the two platforms. The camera quality within other applications was shocking! The interface would freeze and lag often and the Android operating system was just slow in general. The camera has been significantly improved, the image quality is no longer grainy within other applications. I have also witnessed third-party applications mitigate the task of taking a photo to the camera app – This is great because it means you can have all the benefits of the default camera app whilst enjoying your third-party applications. The support for applications on Android has significantly improved from the days of the Galaxy S2! I also love that there is an application out there for almost everything in comparison to iOS. The iOS platform is so heavily regulated it is almost impossible to find a simple application that performs just one task! The frequency of applications crashing has been significantly in comparison to the Samsung Galaxy S2. I believe I have had two applications crash since I bought the phone which is amazing! The Samsung Galaxy S2 (and the associated Android version) crashed multiple times a day! The only issue I have had so far is when WhatsApp stops running in the background which then causes WhatsApp web to stop working. I have however figured out this was because I denied the application access to certain permissions (Phone, SMS, etc)! This all began back in January of this year (2017) simply because my mobile carrier offered an upgrade from my SIM only plan to a contract which included a phone. The choices of phones were the iPhone 7, Samsung Galaxy S7 and the Google Pixel – each phone had their own advantages and disadvantages. Previously when I tried Android on the Samsung Galaxy S2 and Sony Experia Z3 there were many issues which stopped me from fully migrating over from the iPhone and these were primarily related to the operating system rather than the hardware these phones offered. The main Android related issues were related to the Camera quality (grainy pictures and low quality images) and general behaviour of applications developed for Android. I would experience applications crashing multiple times a day and this is the main reason I never returned to the Android platform. I did, however, switch to the Pixel XL after careful consideration of all my options and due to the subconscious bias towards the Pixel XL due to the targeted advertising on multiple platforms (Instagram, Facebook and general web browsing! Well done Google Ads!). 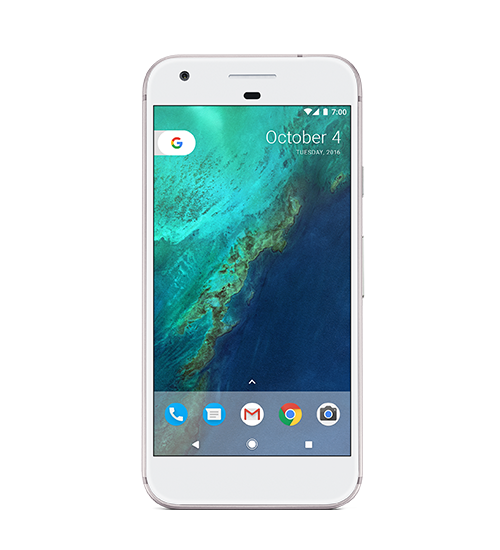 I am very happy with the Pixel XL and the Android operating system as a whole.I hope that this phone lasts at least two years because it is getting pretty expensive switching phones every year. I sincerely hope Google does not submit to planned obsolescence by requiring the Android operating system to use more resources than required to run smoothly but I guess only time will tell!